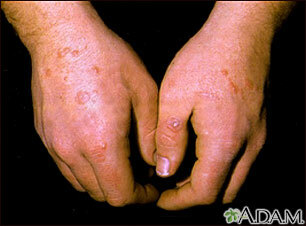 Erythema multiforme on the hands: These lesions are circular and may appear in concentric rings (often called target lesions). They may be associated with other medical conditions such as infections or medications. Cold sores (herpes simplex on the lips) is often associated with this condition. Updated by: David L. Swanson, MD, Vice Chair of Medical Dermatology, Associate Professor of Dermatology, Mayo Medical School, Scottsdale, AZ. Also reviewed by David Zieve, MD, MHA, Isla Ogilvie, PhD, and the A.D.A.M. Editorial team.